The town started life as the fishing village of Torre, being named after a rocky outcrop (Tor) which once dominated the area. In 1196 AD Torre Abbey was built nearby but the settlement remained small until the early 19th-c when the town began to attract many visitors, particularly the infirm, who considered Torquay a convalescence retreat where they could shelter from the colder winters experienced by the rest of Britain. The coming of the railway in 1848 accelerated the town growth and Torquay grew into a resort favoured by the cream of Victorian society. 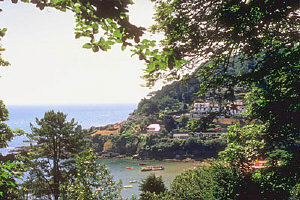 The Torbay area gained the reputation as the English Riviera due to the mild climate and sub-tropical trees and gardens. Today, Torquay retains much of its elegant charm with its sparkling white villas looking down from terraced hillsides, exotic gardens around the seafront and many fine Victorian buildings lining the main streets. Torquay's waterfront remains the focus of the town's life. The lively harbour and international marina, the promenade and seafront gardens and the sandy beaches make it a classy holiday destination. The 22 miles of the Riviera coastline sport some 19 beaches and coves all within easy drive of Torquay. Just a short journey from Torquay, the medieval village of Cockington is set in a wooded country park. There is an historic thatched forge, picture-postcard thatched cottages, a pub, a church and even thatched public conveniences. Horse and carriage rides are available for exploring the surroundings. From Saxon times, Cockington Court was the manor house for the old village squires. It is now managed by the Torbay Coast and Countryside Trust and provides tea rooms and a craft centre. The famous crime writer was born in Torquay and lived most of her life in the area. This mile long walk visits 10 spots around the harbour and seafront which are associated with the authoress. At 8 of these landmarks there are clues which spell out the name of one of her characters. This outdoor miniature village is located just outside of Torquay and occupies a 4 acre site. There are thousands of miniature buildings, people and vehicles with over 1000 ft (300 m) of model railway track. This has got to be one of the best and most detailed model villages in Great Britain and it is particularly impressive when lit up at night. Authentically reconstructed Victorian town, with over 20 period shops and businesses including a forge and traditional pub. Also includes a model railway, miniature fantasy land and walk-through WWI trench experience. An important Paleolithic (stone age) and archaeological site. Where 500,000 years of history have been uncovered during years of careful excavation, unearthing thousands of important artifacts and opening a window into how our ancestors lived. Torquay's coastal zoo with seals, puffins, penguins and water foul. All round viewing from above and below. The historic medieval abbey has been well-preserved and is particularly known for its formal gardens. It now houses an art gallery with one of the largest collections in Devon. There are regular exhibitions by contemporary artists.